Reading and share top 10 famous quotes and sayings about Ideal Community by famous authors and people. Browse top 10 famous quotes and sayings about Ideal Community by most favorite authors. 1. "Industry, technology, and commerce can thrive only as long as an idealistic national community offers the necessary preconditions. 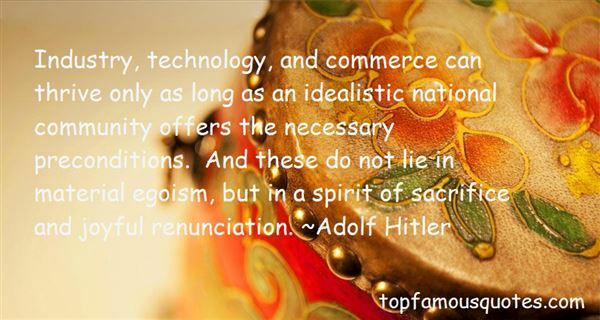 And these do not lie in material egoism, but in a spirit of sacrifice and joyful renunciation." 2. "My family life and my ideals, my commitment to the community and to other people - all people - has been improved. I think less about myself and more about my community today." 3. "God hates this wishful dreaming because it makes the dreamer proud and pretentious. Those who dream of this idealized community demand that it be fulfilled by God, by others, and by themselves. They enter the community of Christians with their demands, set up their own law, and judge one another and even God accordingly." 4. "The community of the saints is not an "ideal" community consisting of perfect and sinless men and women, where there is no need of further repentance. No, it is a community which proves that it is worthy of the gospel of forgiveness by constantly and sincerely proclaiming God's forgiveness...Sanctification means driving out the world from the Church as well as separating the Church from the world. But the purpose of such discipline is not to establish a community of the perfect, but a community consisting of men who really live under the forgiving mercy of God." 5. "And many years later, as an adult student of history, Knecht was to perceive more distinctly that history cannot come into being without the substance and the dynamism of this sinful world of egoism and instinctuality, and that even such sublime creations as the Order were born in this cloudy torrent and sooner or later will be swallowed up by it again...Nor was this ever merely an intellectual problem for him. Rather, it engaged his innermost self more than any other problem, and he felt it as partly his responsibility. His was one of those natures which can sicken, languish, and die when they see an ideal they have believed in, or the country and community they love, afflicted with ills." 6. "There are these rare moments when musicians together touch something sweeter than they´ve ever found before in rehearsals or performance, beyond the merely collaborative or technically proficient, when their expression becomes as easy and graceful as friendship or love. This is when they give us a glimpse of what might be, of our best selves, and of an impossible world in which you give everything you have to others, but lose nothing of yourself. Out in the real world there exist detailed plans, visionary projects for peacable realms, all conflicts resolved, happiness for everyone, for ever - mirages for which people are prepared to die and kill. Christ´s kingdom on earth, the workers´paradise, the ideal Islamic state. 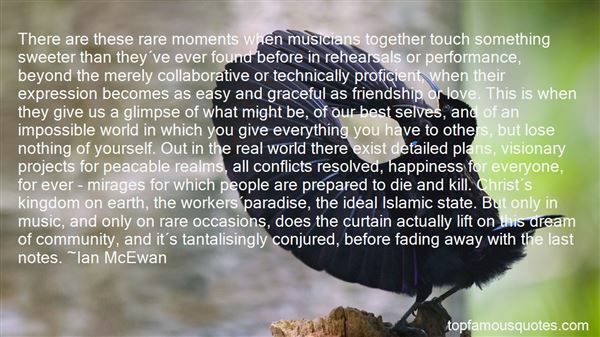 But only in music, and only on rare occasions, does the curtain actually lift on this dream of community, and it´s tantalisingly conjured, before fading away with the last notes." 7. "The genuflection toward 'fairness' is a familiar newsroom piety, in practice the excuse for a good deal of autopilot reporting and lazy thinking but in theory a benign ideal. 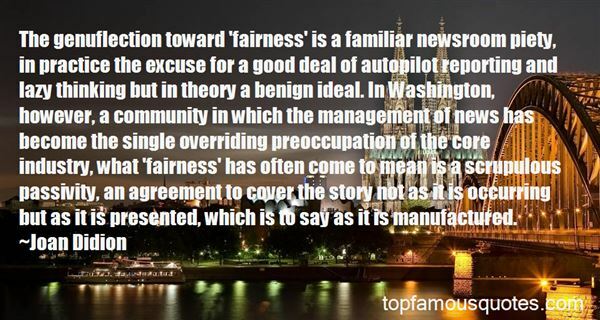 In Washington, however, a community in which the management of news has become the single overriding preoccupation of the core industry, what 'fairness' has often come to mean is a scrupulous passivity, an agreement to cover the story not as it is occurring but as it is presented, which is to say as it is manufactured." 8. "In my opinion, if 100% of the people were farming it would be ideal. If each person were given one quarter-acre, that is 1 1/4 acres to a family of five, that would be more than enough land to support the family for the whole year. If natural farming were practiced, a farmer would also have plenty of time for leisure and social activities within the village community. I think this is the most direct path toward making this country a happy, pleasant land." 9. "Working outward in concentric circles from the single mother's situation, we can easily draw a picture of what a 'good' mother-son relationship needs in order to flourish. In its ideal form, mom would be experiencing physical, material, social, and emotional support from four interdependent sources: an intimate partner who is also attached to the child; a select group of close friends and family; a wider community that supports mom's values and goals; and a maternity-flexible workplace." 10. "I emphasize self-esteem, self-confidence, and dignity, not as an ideal, but as a real test of community organization. Without leadership development, community organizations do not have staying power." Fashion is fickle, and I was published because I was fashionable. Because I was gay."